If the HubSpot form you've embedded on an external page isn't working, is getting cut off, or doesn't look correct, confirm that the embed code on your external page is correct. In the upper right of the form editor, click Share. In your browser, navigate to Diff Checker, a text comparison tool. In the Original Text section, paste the form embed code. Right-click anywhere on the external page and select View page source. 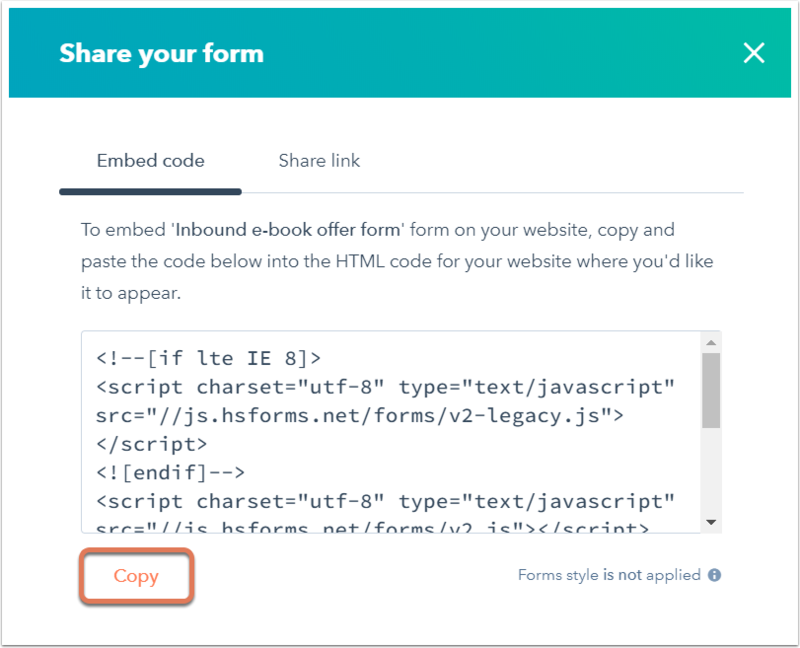 Locate the form embed code on the page and copy it. Navigate back to Diff Checker. In the Changed Text section, paste the externally embedded code. Click Find Difference to look for missing or broken code. If the externally embedded code is incorrect, re-embed the correct code on your external page. WordPress may convert '&' in the embedded form code to '&amp;' which will break the functionality of the code. If you see that WordPress is altering the embed code, use a third-party plugin (e.g., Insert HTML Snippet) to add the form to the page or post in the form of a shortcode to preserve the script tags. If your form is embedded on a Squarespace page, it may not work because in certain templates, Squarespace renders scripts only upon the first page load and not thereafter. Refer to this Squarespace post for more details and possible workarounds.